Been meaning to get back out here and finally made it late Sunday afternoon. I really enjoy this course because it's straightforward and a place where you can post a good score (like I did today!). It's a bit of a drive since it's situated in the middle of Union County halfway between Monroe, Indian Trail and Waxhaw. They've really picked up the construction on the neighborhood now. So the landscape has changed, especially behind the par 3 third and to the right of number 4. Right now, the trees have been cleared and so it's just dirt piles. Besides that, they are working on the tee boxes everywhere but especially the front 9. They've chopped down lots of trees on the front 9 too. Hole #5 needs some love. I think they intend to sod around the areas where they cleared trees but right now it's rocks and dirt all along the left side of the hole and up to the green. If you stay on the fairway around this layout, you'll love the conditions. If you get off the fairway though, you will have some difficult lies on dirt and rocks. The greens and bunkers seemed to be in good shape. The bent grass greens have held up well and they were not too many unrepaired ballmarks. I thought the speeds were average but putts were rolling true. All in all, very good conditions for late summer. I will complain a bit about the rate though. $54 for a Sunday 4:30 tee time? My partner said he asked for a twilight rate and got $29. Why was I charged $25 more?? I'll be sending the course a note. Assuming the price is right, I'll be back here again soon. Greens are getting a bit chewed up from the heat. On a scale of 1-10, I'd give the greens about a 6. The grounds crew are working hard to keep the greens playable. Fairways were in almost perfect condition. Traps were good as well although I was only in 1 on them all day. My fellow golfers didn't seem to have any issues with the bunkers they were in. Staff is friendly and the rangers do a nice job going around the course, keeping groups on time without being too pushy. Definitely a course worth playing. I enjoyed my visit back to a layout I enjoy and that lends to good scores for me. Course conditions outside the greens were pretty good. The bent grass greens are struggling as the summer winds down though. The pro shop gave me the heads up that 4 of the greens needed to be punched -- 3 on the front, 1 on the back. So those will need some time to come back. The others were fine, though the green speeds were fairly slow, as I think they are reluctant to cut them low due to the heat stress. I'll probably give the course a break until the fall, but I'll be back. Came away less impressed than I thought I would be. Greens cratered with unrepaired ball-marks, and the lack of rain is very evident on the course. Still, putts rolled well and lots of variety. I'll come back when conditions are better. Course is in great shape, greens perfect, ball marks are being repaired a lot better than last time we played. Fairways excellent. Go there. Played Stonebridge for the first time, Oct. 14, 15. Good layout, scenic holes, fair bunkering, and bent grass greens in great shape and fast. Was able to play the ball down with no problem. Good value with deal through Golfnow.com. Played blue tees (~ 6400 yards), within a foursome in about 3.5 hours. Definitely the kind of course I would like to play again, although the 1 hour 20 minute drive to the course is a limiting factor for me. One of the nicer courses in the Charlotte, NC region. Course was in good shape especially after all the rain last week. Their were some low areas that were damp, but overall pretty good. This is the first time I played Stonebridge and enjoyed the round. Pace was a little slow, their was a group in front of us that backed everyone up. It did get better on the back 9. Tee boxes were good. Fairways were very good and greens were receptive but pretty quick. Were a fair amount of marks in the greens but for the most part ran true. Will be coming back. Stonebridge is in really good shape, tee to green. The greens are just a little on the slow side as they protect them from the summer heat by keeping them a little longer. No issues to report, though. The water level is very low in the lakes and ponds -- we saw a hundred golf balls in the mud short of the par 3 17th. Couldn't believe no one had retrieved them yet. The staff was friendly and helpful -- my clubs were picked up at my car immediately. This course can be pricey even with a Clickit deal but it's being managed well. Continues to be one of the better courses in the Charlotte area. Greens rolled nicely, the fairways were some of the best in the area, and the bunkers were in good shape. The guys out at Stonebridge continue to put out a great product. It's a real pleasure to play out there. Greens and fairways were 9 out of 10 and no problems with the bunkers. My only complaint has ever been that 18 seems so plain and uninspired. other than that I love the course. As I've said before I really like Stonebridge. The greens had been punched and were still bumpy, probably a week away from being back to good. The tee boxes were worn. Sand looked good, but I didn't play from it. Fairways still growing in. The fairways were great, they were dragging them to get the clumps of grass out from mowing. Sand traps were wet from rain, but Ok. Greens held great, but were pockmarked from balls hitting them. They rolled great unless you hit a mark, but we just played around them. I really like Stonebridge. I had not been back to Stonebridge yet this year. So I was overdue. I enjoy this course -- it's kept in good shape from tee to green and is a relatively easy layout with plenty of scoring chances. It didn't disappoint today. The $28 after 3pm rate was nice too. One of the reasons I don't get here very often is the high fees on the weekends. Tees, fairways, rough and bunkers were all in great shape with no issues or complaints anywhere. The greens were in decent shape, really just ball marks to complain about on the bent grass surfaces. The pro shop and starter were both nice and helpful. The course is being aerated this week so you'll want to give it a few weeks to come back. I agree with B-man's assessment! Just love this course. Clubhouse, putting green, practice area, course are all just awesome. I just kick myself every time I go back because the 5 hr rounds just KILL me. My last 4 rounds here this summer were all well over 4.5 hrs. It's just too long to wait...hit....wait...hit... It's 94 degrees! Let's go! Once again Stonebridge is on great shape. The only complaint as always at this course, people do not fix ball marks. The group I played in must have fixed 50 a piece during the round. Went out to SB yesterday before the storms hit and wow! This place is in wonderful condition. Greens are slower than perfect but in great shape. The fairways are perfect. Played 9 holes in one hour and fifteen minutes. Loved this layout, people in the clubhouse and starter were very friendly. Started on the back 9. Got a special rate because the greens were aerated a week ago. Got matched up with 3 random guys, one was a former NFL player. The conditions were incredible, tee boxes, fairways were great. 4.5 because the greens were not in their perfect form but I'm confident they will be in a few weeks. I'll come back for sure. Great track as always. Still brown and kind of muddy but that is expected. Tee boxes a little rough but that is expected this time of year. They just punched the greens but in a few weeks they will be the best around if people will fix ball marks. Always a pleasure at this course... Bent grass and always do a great job keeping it in shape and good customer service. First time playing Stonebridge. It has a great mix of hard holes, mostly on the back nine, and plenty of holes to challenge your course management and self control. Similar to a well know TPC course in north Florida, Stonebridge has a card wrecker 17th hole that will challenge the best ball strikers. Current conditions are perfect all around, The greens are flawless and very fast. The fairways are in great shape with no issues, The is not as high as some courses, it is very possible to get a decent lie on the Bermuda turf. The bunkers have plenty of sand but didn't seemed to be raked the day I played. Thankfully I didn't have to play out of any. Stonebridge does have some blind shots of the tee and your second shots. Play with someone who knows the course, like I did, and you will save yourself 5-8 strokes on the round. The staff was super nice. I was greeted by a guy with a cart at my car even before I turned of the ignition. Pro shop was nicely stocked as well. Play this course if you are in the Monroe area, you won't be disappointed. Considering all the rain we have had, the course was in fair shape. It was cart path only. I judge a course based upon its greens so.... Anyway, Greens: B+/A-; Fairways: B (some standing water); Tee boxes: B; Pace of play: B. I would say wait about a week and let the course dry out before you play it. I've played here before and really like the course. I found it to be perfect today. The greens were super and fast and true. The fairways are grown in very well and the rough is just about right. The traps are excellent, and I hate traps. What else can I say. it was slow but thats because it was a holiday weekend BUT the greens were perfect. we are talking country club quality greens. some of the tee boxes and fairways need some help but the greens are what matters the most to me and these were superb. also always receive good service from this staff. make sure you get their VIP card - it can save you a lot of money. one of my favorite courses in the area.. if i lived closer i would play it exclusively. I took a short game clinic with Fred Bond in the morning and then went out to play a round in the afternoon. Big thumbs up for both. Fred is a great teacher and I was able to put some of his teachings into practice right away with good results. The short game practice area at Stonebridge is great -- big green for putting/chipping practice and several smaller target greens for pitching. They also have a nice big sand bunker. As for the course, it was in fabulous shape. Greens were just perfect. The whole experience was great -- pro shop is well stocked and the staff seemed genuinely interested in making sure everyone was having a good experience. The beverage cart made it around to us several times during the round. They also have a hole-in-one deal on #3 - $3 to have a shot at $10,000 for a hole-in-one, $20 if you get it within the flagstick and the consolation prize is that regardless of your shot, your ticket is good for a draft beer after the round. You can't lose on that deal. Stonebridge has improved since the last rating. The greens are on the fast side, they still show signs of being punched but it is not effecting the roll of the ball. The sand traps are in great shape. The tee boxes showing signs of use. The fairways are still just a touch on the thin side (but not too bad). Hopefully a little warm weather will thicken them up some more. Brand new golf carts with nice canopy for clubs during weather. This course is good to go and is only going to get better with a little more time. I was very dissapointed with Stonebridge. They punched the greens 5 weeks ago and they still have holes in them. What was worse is the fairways, rough, everything was terrible. I've heard that they have been getting outings after outings and the course shows. It's in the worst shape I've ever seen it and they need some major work otherwise the course will be below avg all year. No one fixes ball marks or divots and with wet conditions to get the grass back will be hard. Carolina Lakes and Ballantyne Resort were much better and had deals in 50-55 range as well to play. This is my "home" course and normally it's in great shape but not right now. The greens were plugged a while back but still needs some time to come in. The fairways are ok as well but a lot them have crab grass and weeds every where. Tee boxes are mostly in rough shape but most are this time of year. 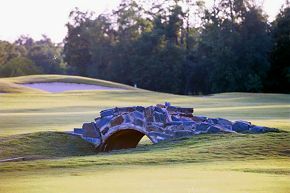 Stonebridge is in its normal condition, for those of you that play here. The greens are not as nice looking (due to the cooler weather) but the ball is still rolling good. They just put brand new white soft sand in all the traps, therefore the traps are in perfect shape. They also had ground crew out keeping the fairways and greens clear of leaves. Still a good course to be playing this time of year. Stonebridge is in its normal condition (good shape). Only one bad thing to report (which is not their fault), they just punched their greens and put a layer of sand down. They are playable but they do bounce some. I would give it a few weeks before going out there. Stonebridge was a busy place on Saturday morning, but pace of play was normal. And the course was in great shape. Everything was lush and well-manicured. While the greens were a bit thin in spots, the speed was very good (read: fast) and consistent. I was happy with the experience and it feels like a treat to play here -- nice clubhouse, good staff, beverage cart service, expansive practice area. With their frequent player's card, you'll always get a better deal than Clickit and never pay more than $47. The B-Woman bought me a voucher at $55 so I had to use or lose it. Otherwise, I woulda used my card. The course also does a deal where you pay $3 for a hole-in-one ticket and get your chance at $1000+ on one of the par 3's. If you get within the flagstick (about 8 feet), you get $20 and even if you don't get close or on the green, your ticket is worth a free drink at the end of the round. Nice deal. The greens are soft and bumby. Many,many ball marks. Shame cause I played there about 2 months ago and it was in pretty good shape then. Overall I give it a B-/C+. Positives: Excellent staff. Consider other options before you play here currently. Greens: "B" grade. (areation happened 2 weeks prior but they have healed real nice). Little slow but no issues. Fairways in excellent shape & tee boxes have aeration punches but are in good shape. Worth playing this course but maybe wait a week so greens can be fully healthy. Right now they are at 90% healthy from aeration. The golf course is in excellent shape right now! The fairways are firm so you get a nice amount of roll. The greens are firm as well but they will hold a solidly struck shot with any club. They have been watering the fairways and rough so there is a lot of grass on the fairways. If there is any complaint, the greens are a little on the slow slide but they are rolling very smooth! The only gripe I have about Stonebridge is the pace of play. It always seems like we get stuck behind the slowest groups out here but it has to be the way the course is laid out. That par 3 - 3rd and then guys waiting to tee off on 4 until they hear the bell is just a disaster. It completely holds up traffic and I'm super lucky to ever get a 4 1/2 hr round out here. The course is in good shape for this time of yr. The greens are a little dented up but apparently that's because the last 400 people that played the course forgot their divot tools at home. Seriously people...repair your ball marks. Stonebridge was in pretty good shape today. The tee boxes are pretty scarred up but that’s not too big of a deal to me. I guess they poked holes in the greens about 3 weeks ago then they put a coat of sand on them and rolled them. Now the greens are a little on the fast side and the ball rolls smooth. You can actually see a sand splash when you fly one into the greens. This is my favorite course now. I've only played for about a year now, but out of the places I've been (Monroe CC, Charlotte National, Mooresville CC, and Pine Lake), this is the best I've been to. I love the setting, the road that this runs across isn't very busy, you don't have to worry too much about the people driving by honking their horn just before you go to sink your winning put. Speaking of greens, I can tell that they are normally kept in good condition, but given the rain we have had, they were very soft and marked quite a lot. I was a little nervous because of all the marshalls driving around; we had a group of four, and two of us (including myself) were not the best. Luckily, we kept up with the group in front of us so it was never a problem. I am definitely looking forward to my next trip there! Overall the course was in good shape and has held the summer heat well. Tee Boxes need some work. Fairways and roughs were cut to a good length. The sand in bunkers was a bit inconsistent. Some of the greens need help, but most greens rolled true. Definitely worth the $36 we paid. Really wish they had more Marshals on the course. I usually don't complain unless something really bothers me, but what I saw on Saturday was ridiculous. Right about at the 12 hole, 2 groups of 3 started playing as a 6-some. We almost had to wait 7-10 minutes on every hole. One of them even had a boom box which was playing music really loud. They wouldn't even let us play through. So, my friend calls the club house by the 15th hole to complain hoping they would do something and the marshal comes out and says we don't usually allow this kind of behavior and just drives away. They let them play 2 more holes and finally splits them up on the 18th!!! Instead of having guys picking up our clubs and cleaning them I would have much rather appreciated they stop this kind of foolery. I didn't finish the course unfortunately because of the rain, but the 7 holes that I did play were all in great shape. The greens were a bit marked, but I'd think that its expected at this point in the season. The staff is friendly..... it being my first time there I was kinda "lost." Tried to start off at the 10th tee. The starter came over and put me on the right path after my goofy error. Gave me a pamphlet with the course layout too. Can't wait to go back. Got a $16 credit since I stopped after 7. They've got great rates at 6 PM. 16 bucks for a round. Stonebridge was in great shape as usual. The greens were a little more marked up than the last time I played there in May. I'm guessing people will never learned to repair ball marks. The $16 rate after 6pm might be the best deal in town. the only thing i have to complain about is the lack of yardage to ponds /lakes /or any creeks that cross the course! it seems like the course is trying to get you to buy the caddy book which would tell you the layout ! no signage at tees to the "trouble" other than that the course was in fine shape!!! Stonebridge still looking great. Greens were rolling a tad bit slower than I'm used to but still good. I wish people would learn how to at least attempt to use a divot tool on the greens. Pathetic how many unrepaired divots there are on the greens...not the courses fault. Anyway...great play as always. The best bang for your buck around period. Only problem is everyone is finding out about it, and pace of play is really starting to get slow. 5 hours on the weekend is a sure thing. Overall: A- ranking. Greens had very true roll and in excellent condition. Tees and fairways were in very good condition also. There were heavy rains the prior night so it was cart path only. I would say the greens were among the best I've played this year. Played Stonebridge for the first time on 5/15. WOW! The course was in fantastic shape, despite it being wet. The greens were by far the best I've seen in quite some time in the Charlotte area. Putts rolled true and stayed online, and this was after play all day on Saturday. The rest of the course was in really fine shape as well. I can't wait to get back to play again. If Stonebridge Golf Course were a lady...well...you get the idea. Unreal how nice this course is playing right now, so early in the season and everything is green, fairways are lush, greens roll true, tee boxes are great, etc. I live roughly 25 minutes from this course in the Ballantyne area and I drive here every weekend to play. I just can't bring myself to play any other course right now because of how nice they have this course running. We played on Mothers day and had a 10:40 tee time. Pace of play was good because not a lot of people were playing that morning. The only real downside I can say about Stonebridge is I have played some longer rounds out here, in the neighborhood of 5 hours. Mostly due to the 2,3 and 4, holes seem to back up traffic a little. It seems like once you get past the par 3 6th over the ju ju things start to speed up quite a bit. I also like a lot how the front nine and back nine just feel different. You never get bored out here. There are some shots that when you hit them it keeps bringing you back for more and more. Stonebridge isn't a super demanding course but will reward you fro straight shots. You don't have to be super long to shoot well here. Pin placements seem to always be fair and the greens...ahhh the greens...best rolling and fairest rolling greens I have played in a long time. The only other greens that roll as good that I've played recently was at Tega Cay. Anyway, if you haven't played this course you have to make the Saturday/Sunday drive down to Mineral Springs and check out this little secret gem. You won't be dissapointed. Nice conditions, just a few greens that had some minor issues. The best pro shop of any daily fee course - lots of nice stuff, nice discounts. Almost a perfect course. Made the drive from Charlotte worth it. Greens were very well maintained, fairways showed very little wear and the rough was cut the perfect length. Course played on the easier side, but still had a few challenging holes. Except for a really slow 2-some we should have been done in 4 hours, but would have appreciated a ranger to come by and ask them to speed it up. Stonebridge is in perfect shape. The greens crew there does an amazing job. As an example, they were spraying all of the red and yellow hazard lines yesterday, and re-raking some bunkers. I don't give many perfect scores, but today I couldn't find anything but great things to say about Stonebridge. The pace was awesome. We were a twosome and after a few holes, we never caught the group in front. We finished in just under 4 hours. The greens were immaculate, the best I've played this season. Tees, fairways, rough and bunkers were all good, too. It's an easier course than others around town, with large, mostly flat greens and many holes where you can run the ball up to the hole. Maybe that's why I shoot good scores around here. In any case, I like it and will be back as soon as I'm able. Greens in good shpe for this time of year. Fairways will be better soon.